Documentary film 'Beneath the Helmet' exposing the life of new recruits comes to Canada, with a special screening timed for Israel's b-day. 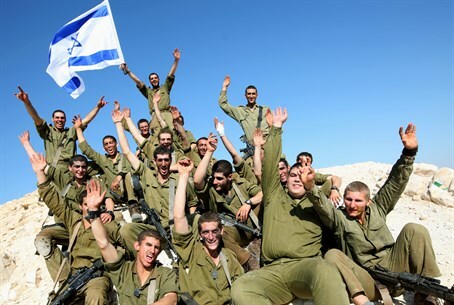 In honor of the 67th Israeli Independence Day next month, Toronto will host a showing of the documentary film "Beneath the Helmet," a movie following five young Israelis who enlisted in the IDF and their experiences defending the Jewish state. The five soldiers followed in the movie include a recruit who arrived in Israel from Ethiopia as part of a large family bereft of a father, a resident of Ashdod which has been hit heavily by Hamas rockets, the son of an immigrant from the US, a youth whose family left Israel for Switzerland and decided to return for IDF service, and a young woman from Herzliya who became a commanding officer. The screening was organized by Aish HaTorah in Toronto together with Thank Israeli Soldiers, an organization aiming to show appreciation for IDF soldiers through a range of activities including trips in Jerusalem, care packages, and professional guidance to help them integrate back into civilian life. "Beneath the Helmet" was screened at the AIPAC conference earlier this month, where co-producer David Coleman explained to Arutz Sheva "the idea of the movie is to show the world the soldiers beneath the helmet, who they are, what they stand for and why they do what they have to do." Jerusalem U, an NPO which was established in 2009 to strengthen the connection of the younger generation to the land of Israel and Jerusalem through a range of cultural activities, is behind the production of the documentary film. Toronto's screening will take place on April 27, at 7 p.m. at the Cineplex Cinemas Empress Walk located at 5095 Yonge Street. Tickets cost 18 Canadian dollars, and can be purchased online here.